First a note: I love yogurt. And I will love it whether it is plain, eaten straight out of its little container, or whether it is piled with delectable add-ons and christened “Paradis Latin Yogurt Extravaganza”. I always buy it plain (Oh how I wish I could make my own! Soon…) so I start with a nice blank palette which I can embelish…or not. But some mornings (and you know which mornings those are) definitely call for some embelishment. 1. Find a nice sundae-like container. 2. Put in some fruit. I used fresh pineapples, because why live in a tropical country if you can’t have fresh pineapples from your neighbor’s farm right? 3. Pour in the yogurt. Still plain store bought for me (sigh), but one day I will make my own! There have been attempts but the end-product was too sour…I think our starter was a bit persnickety. 4. Sprinkle (liberally) with your crunch factor. I used crunchy muesli, but you can use granola or nuts or a mixture of all of the above. Again this is store bought, but there are some yummy sounding granola and muesli recipes out there that I am quite excited to try. 5. Slip in something sweet and syrupy (again liberally, unless you have no sweet tooth). I used the lovely chestnut flower honey made by Agrimontana. 6. You can choose to now adorn it with some useless but charming accessory like a plastic monkey or a cocktail umbrella…but I didn’t have any. I feeling mighty fine now, and despite the weird weather (our rainy or WET season is starting) I have the urge to proceed in flip flops and a nice tank top. Speaking of “mother”, we used to call our starter the “mother alien”, haha! 🙂 But the yogurt it produced was really thin and sour. Sobra siyang masungit ata. I still dream of the yogurt from Greece…which is my absolute favorite! 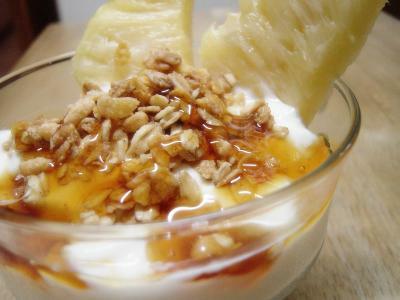 Just another crazy suggestion from me: peach mango yoghurt parfait! Just layer sliced fruit with plain or peach/mango flavored yoghurt and top with flaked almonds. Yum! (Incidentally, since I’ve a lousy hand for making my own yoghurt, I prefer Leche Pascual‘s peach and passionfruit and apricot-mango flavors. are pinoy food bloggers channeling each other again? i had something similar this morning — except i used peaches and blueberries for the fruit! *and* i have a pic in my hard drive waiting to be uploaded of a ham-egg-cheese biscuit that looks almost like your previous post. aliw! whoa another pinoy food blogger! am in france for few months lot of yogurt! Hi Schatzli! Lucky you! In France now and living in Greece…with all the Greek yogurt you can eat 🙂 I was based in Greece for a couple a months in my previous job and I loved the food and miss it very much. I actually have visited your blog before(found the link at Market Manila) and enjoy it a lot…especially as it helps in satisfying my “Greek-cravings”. Enjoy your holidays! Here’s a recipe you might like to try out: it’s for my coffee-flavored Yoghurt Marble Cake: http://twistedtwinset.blogs.friendster.com/my_blog/2005/07/javalicious_mak.html.